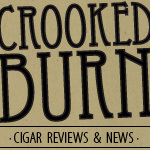 The excitement around the cigar up for review today would be deafening if the internet could scream. 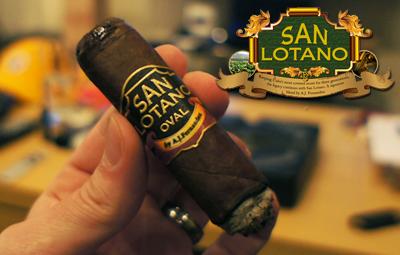 The San Lotano Oval from AJ Fernandez has been reviewed now on many sites and I have personally heard from a few fellow cigar bloggers that this cigar could be their #1 cigar of the year. Those are some big words because I know these guys pretty well and I know they smoke A LOT of different cigars. These cigars are being made at AJ's factory Tabacalera Fernandez in Estelí, Nicaragua, just like the rest of his San Lotano line. A quote from the AJ Fernandez website: The prestigious San Lotano Oval from AJ Fernandez presents in a highly unique oval shape. The key to an enhanced smoking experience: ultra-premium aged tobacco. The new Oval affords a truly distinguished balance like no other. The San Lotano Oval is just that -- an oval. I honestly didn't think this would be that different than the typical round shape of a cigar, but when held, it does feel kind of weird. My cigar was heavily packed and had some significant weight to it. The wrapper was a medium brown color with some veins that were much lighter (almost white) in color. The veins looked like cracks in the wrapper because they were such a different color, but there were no cracks. The pre-lit aroma had some almond scents mixed with a woody characteristic. The cold draw was nice and free, tasting of sweet, natural tobacco. 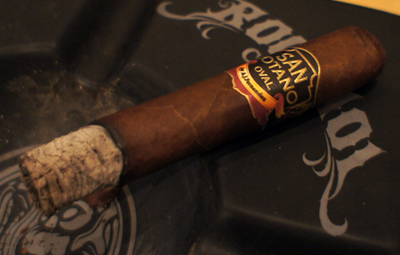 Lighting up my San Lotano Oval took a significant amount of time because, like I said, this stick was jam-packed full of tobacco. Once I got a nice burn going, the initial flavors were a bit rough. I got some unrefined white pepper on the front with a leathery, almost waxy flavor on the finish. The finish also left some unpleasant harshness on the back of my throat. At this point, I was confused as to why so many people were praising this cigar so highly because I was not enjoying it at all. The positives, however, were the construction and the draw. I was able to pull lots of smoke form the cigar without much effort and the burn was nice and straight. The ash is also worth mentioning because it was solid as a rock and held on well over an inch. The cigar strength fell in the medium range. 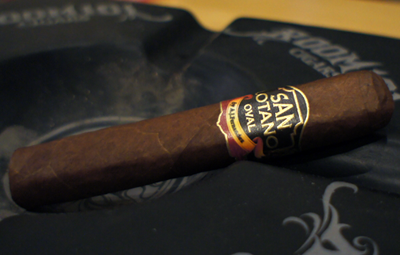 The second third of my San Lotano was completely different then the first third, and I have to say that I'm glad it was, because I was debating putting this cigar down. The rough starting flavors changed into a more balanced woodiness on the front with a polished peppery spice on the finish. The finish was very clean and lacked all harshness from before. Again, the construction was perfect and the draw excellent. I found that if I really wanted to wake my taste buds up, I could push a little bit of the smoke through my sinuses and it created a strong zing of pepper. At this point I'd put the cigar in the medium to lower full range in strength. 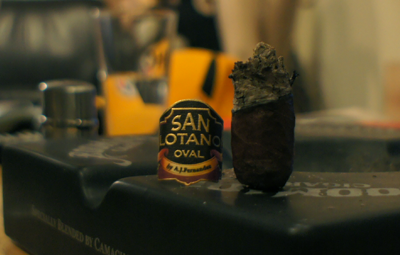 The final third of my San Lotano Oval was the same as the second third with maybe just a bit more balance going on between the wood flavor and the spice. I had commented to my smoking partner that this was a very smoothly smoking portion of the cigar and he agreed. 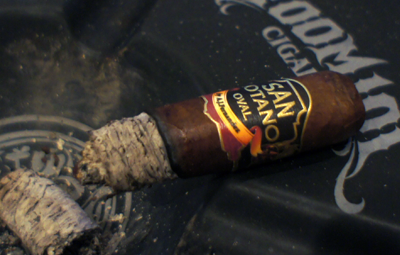 Getting down to the nub, the strength of the cigar picked up even more and I would definitely rank it full strength. Even with the unconventional shape, the cigar never needed any relighting and was easy to smoke. My final thoughts on the San Lotano Oval? I'm glad I didn't let the harsh start to the cigar turn me off right away because once I was past it, I had a great experience. The balance and smoothness of this cigar is what really shines and makes me think that quite a bit of testing went into this stick to get it just right. If anyone else gets a rough start to one of these, just give it time. I think you will enjoy what it turns out to be. Would I buy it again? Yes I would buy more of these. Would I buy a box? This is a box worthy cigar. I'd love to see what some age does to them.